The U.K. economy slowed less than economists forecast in the quarter after the Brexit vote because of a surge in services, providing ammunition for critics of those who warned of a possible fallout before the referendum. 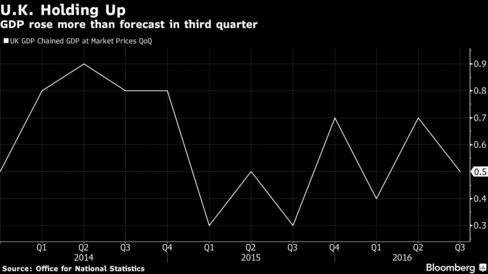 The 0.5 percent expansion was better than the 0.3 percent median forecast of economists in a Bloomberg survey. Services surged 0.8 percent, offsetting declines in construction and production, its performance helped by box-office receipts for summer movies including Jason Bourne and Star Trek. Pro-Brexit economists were quick to seize on the data as evidence that warnings of an adverse impact on the economy made by the likes of the IMF, the Bank of England and the U.K. Treasury ahead of the vote were overly gloomy. Many of those institutions assumed a decision to leave the EU would trigger a more immediate withdrawal from the bloc, while the process since the vote has been drawn out. The GDP figure covers the period since the vote in June to leave the European Union, as the U.K. came to terms with a decision that sparked a change of prime minister, a sharp drop in the pound, price spats between companies and the first Bank of England interest-rate cut in seven years. Britain has yet to begin formal discussions in the divorce from its biggest trading partner, meanwhile, with Prime Minister Theresa May saying the government will start the process by the end of March 2017. “There is little evidence of a pronounced effect in the immediate aftermath of the vote,” Office for National Statistics Chief Economist Joe Grice said in a statement on Thursday. He added that the economy is growing at a rate “broadly similar” to its pace since 2015. The third-quarter report is the first of three estimates from the statistics office and may be revised, as it’s based on about 44 percent of the information that will ultimately be available. The expansion — though slower than the 0.7 percent in the three months through June — marked a 15th straight quarter of growth. Only three of 50 economists surveyed by Bloomberg correctly predicted the number, with everyone else forecasting a weaker reading. 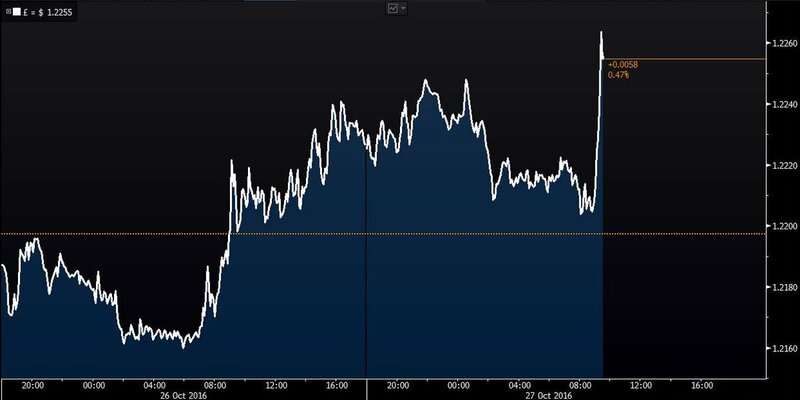 The BOE, which revised up its estimate last month, saw a 0.3 percent pace. The performance may mean the central bank is less likely to cut interest rates again. While Governor Mark Carney has said another loosening is possible, accelerating inflation and stronger-than-anticipated growth may stay his hand. 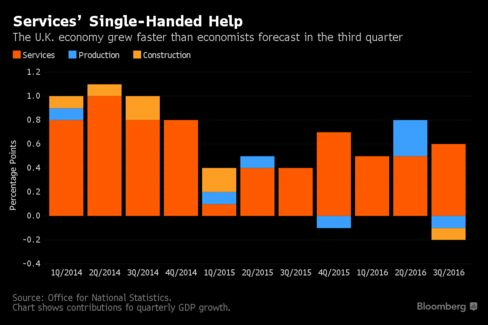 Nevertheless, with economists forecasting that the Brexit effect may take time to filter through the economy, they see growth slowing to about 1 percent next year, half the pace expected for 2016. Economists at Bloomberg Intelligence in London say there’s a chance that a BOE rate cut may only be postponed in November until early next year in response to a more protracted than acute impact from the referendum. Ryan Bourne, a member of the Economists for Brexit campaign group and head of public policy at the Institute for Economic Affairs, said the institutions that predicted a severe, immediate impact on the economy from the vote should now show “humility.” Their estimates were “a selection of wildly inaccurate short-term forecasts based on the poorly-evidenced effects of supposed policy uncertainty and expected lower growth potential outside the EU,” he said. While the economy is holding up well so far, the latest data also show the imbalanced nature of the expansion, with services adding 0.6 percentage point to GDP. Both production and construction were a drag on growth. That imbalance is vulnerable to any forthcoming deal with European leaders: the financial industry accounts for a large portion of services, and its future may be at risk because of Brexit. Mark Garnier, the U.K.’s trade minister, told Bloomberg this week that global banks will probably lose their current legal rights to provide services in the EU as Britain splits from the bloc. He said that an alternative system that’s been floated, known as equivalence, was probably not going to be “good enough” for banks.